Muay thai is a man’s sport. It’s run by men. It’s watched by men. It’s gambled on by men. Its aesthetics are for men. 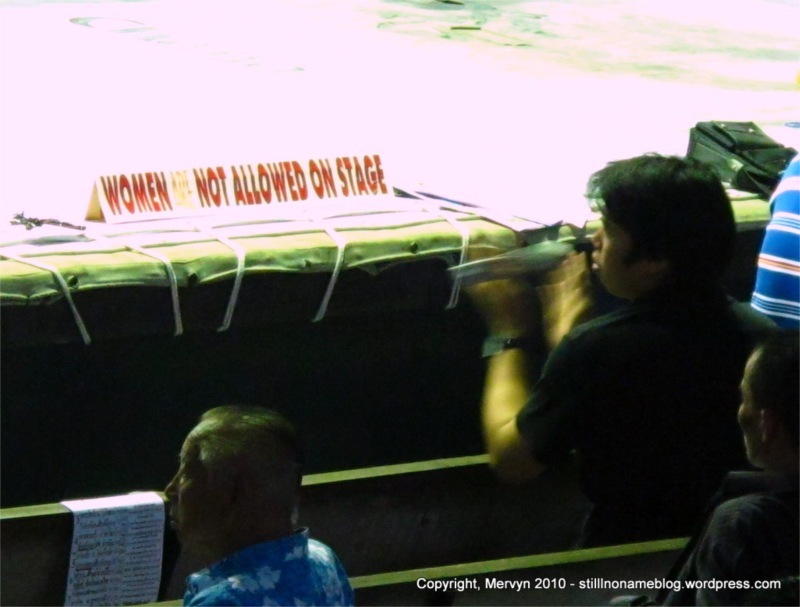 There aren’t even ring girls because women aren’t allowed on stage—it says so on a big sign. There are other manly sports. Boxing, mixed martial arts, and darts are geared primarily towards men. I’m talking something more ingrained, though. Something about the way muay thai is practiced and spectated. 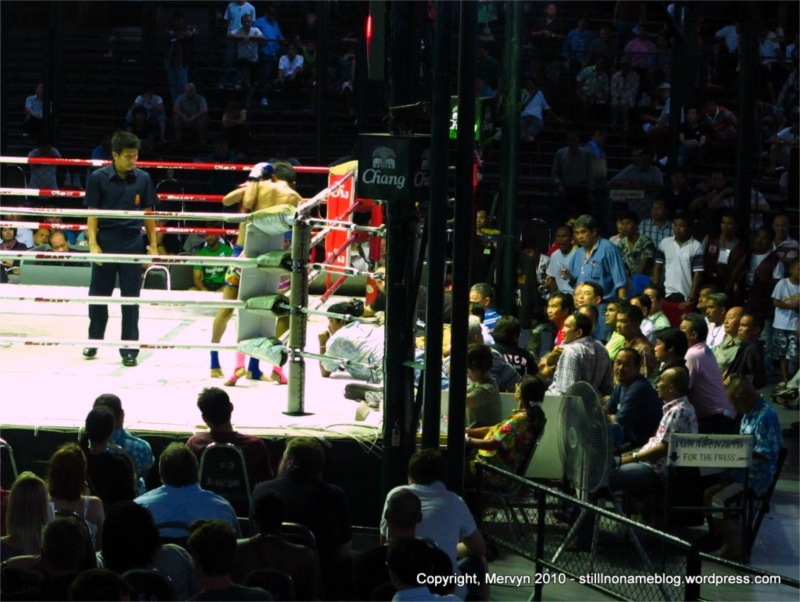 Lumpinee Stadium is one of Thailand’s premiere venues for muay thai, Thailand’s homegrown martial art. The style emphasizes leg kicks with some punching and throwing. I know I know I know. There’s more to it than that. Some muay thai-ophile would jump all over me about the spiritual aspects of the art and the subtleties of leg sweeps, knees, elbows, blocking, striking, balance, grappling, and conditioning. “Oh my gosh golly gumdrops, describing muay thai as kicking with some punches and throws is like describing cooking as mostly fire and some ingredients,” they’d no doubt say. Well, “they” are not here so I’ll give you what I saw, and I saw a lot of kicking (including knees and sweeps) with some punching and throws. Boxing and mixed martial arts (e.g. UFC) are probably the most analogous sports in the West. Surprisingly, muay thai is a lot less bloody. That’s because in the U.S. analogues, people are often trying to hit each other in the face. Faces are delicate. A strike to the face is going to do more than leave a mark; it’ll likely change the topography. Mountains and valleys will form. Rivers and streams will burst forth. Here’s the first reason why muay thai is a man’s sport. 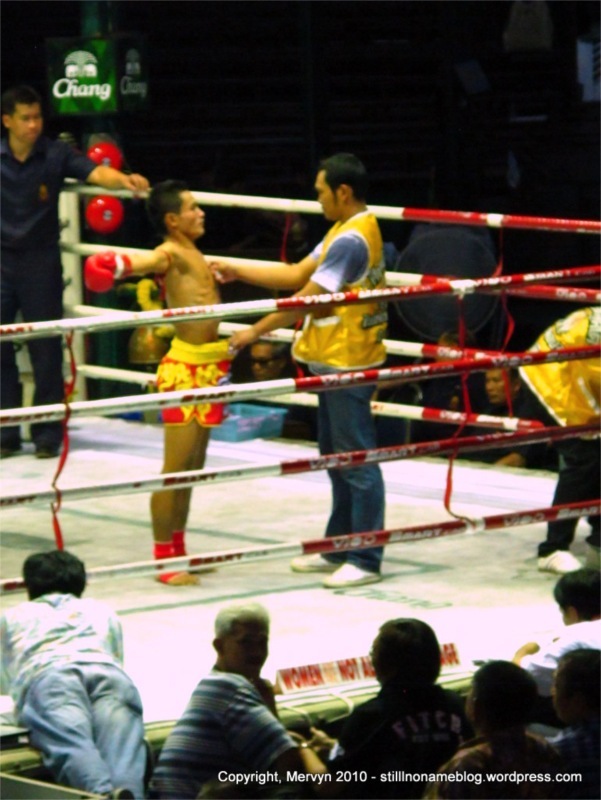 In muay thai, what the judges are looking for is “effect.” They want to see muay thai techniques performed in a way that shows that it has damaged the opponent. Judges want to see a fighter kick their opponent so hard that the opponent moves involuntarily. Knee him in the side and a judge will probably look to see if the victim grimaces. It’s not just that the guy got thrown, but whether the throw knocked the wind out of him. There’s little blood. That’s because muay thai emphasizes kicks, which means most strikes are to the legs and torso, the more sturdy parts of the body. The martial art, like the culture that spawned it, looks for something a bit more subtle. If there’s any bleeding to be done in muay thai, it’ll be done on the inside. The sport, therefore, seeks to find the archetypal man. The tough who guy doesn’t show he’s hurting, even though he is. He wins by not giving anyone the satisfaction of knowing he’s hurt. 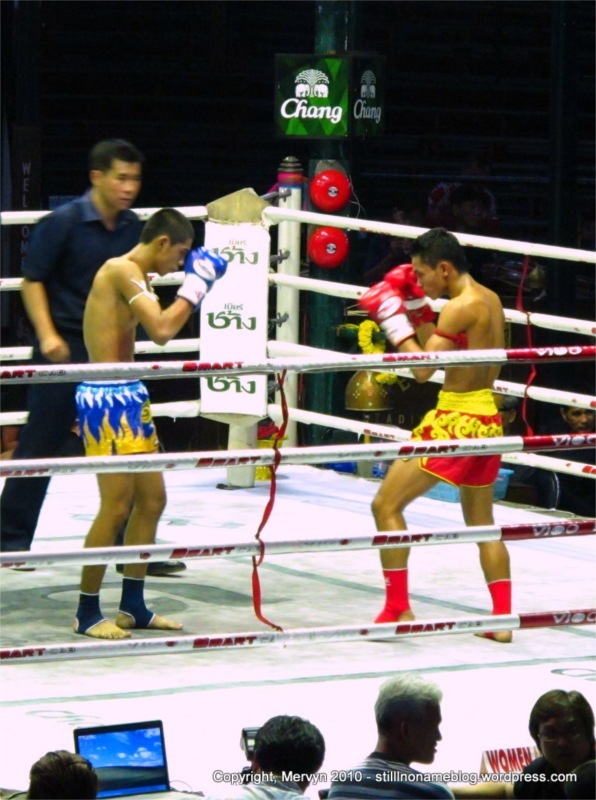 Whether healthy or not, muay thai turns into sport what most guys do naturally: internalize their feelings. The winner isn’t the person who hits the most or hits the hardest. The winner is the man who can act like the blows rained down on him are just droplets from a nice, warm shower. The venue itself exhibits a manly quality. Lumpinee Stadium is mostly open air concrete. There’s a roof over plain tiers of stone. Much of the arena has no seats. Most fans stand while they’re there, only occasionally resting on the cold slabs between fights. 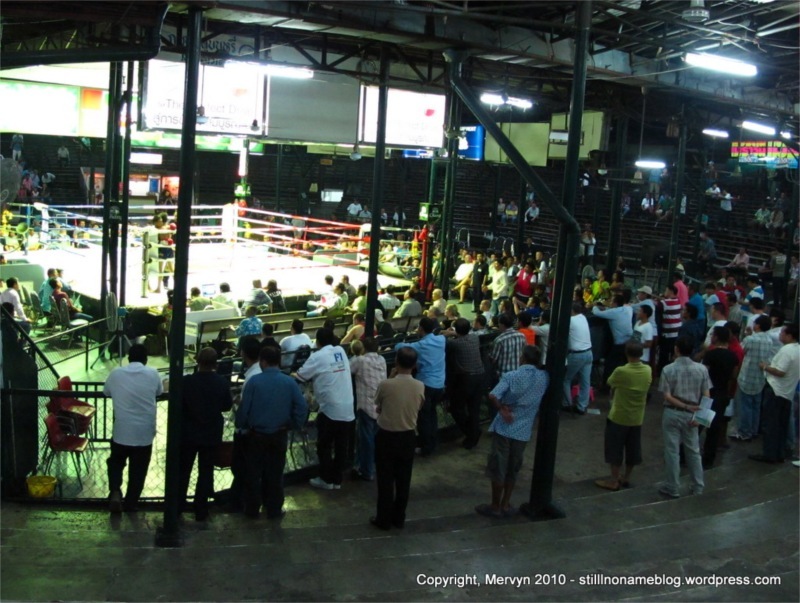 It’s as austere a sporting venue as I’ve seen and remember, this is one of Thailand’s two premiere muay thai venues. The place oozes grit. Sure, there are pretty boys who take their girls to sit ringside on folding chairs, but those are spectators not fanatics. Spectators sit and watch; the fans actively participate. And boy to they participate. 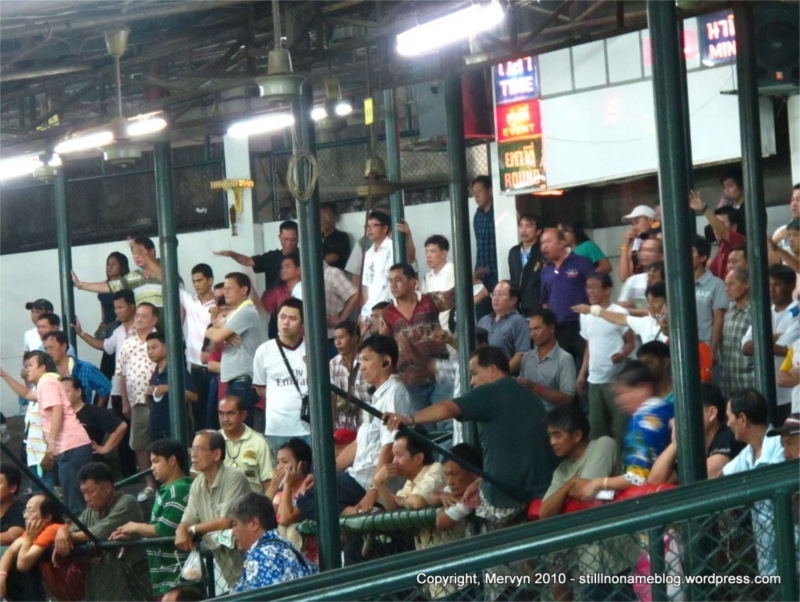 Lumpinee Stadium is one of the few places in Thailand where gambling is legal. Very legal. There are few, if any, bookies though. There is no betting window. 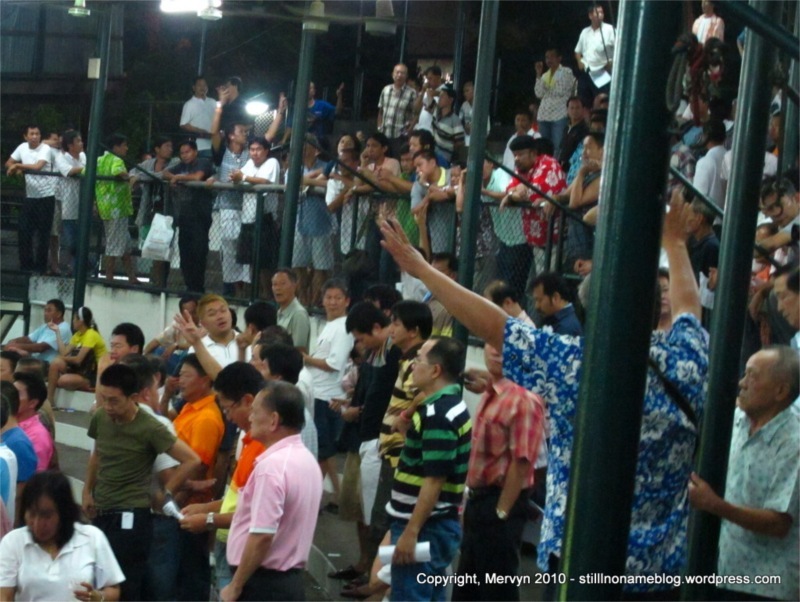 Spectators gamble with other spectators by using hand signals to communicate how many baht they wanted to bet, who they wanted to bet on, and at what odds. 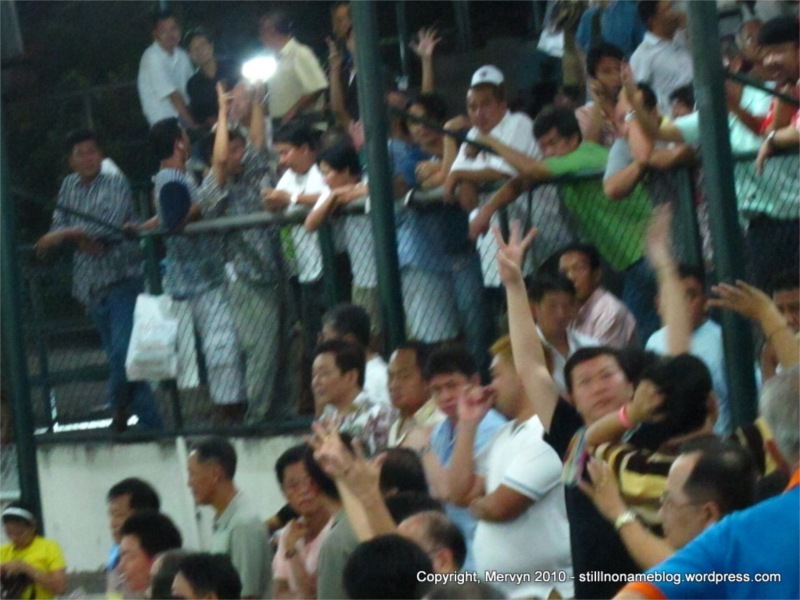 A gambler makes eye contact with another gambler in the crowd–often in a totally different section–who is giving a hand signal that corresponds to the opposite end of his bet. Then the pair yell stuff back and forth to each other while waiving fingers and pointing. From what I could tell this works, mostly. The rhythm of the fight went something like this. The fighters entered the ring draped in flowers and wearing robes, headbands, and armbands. They ditched the robes and flowers then walked around the ring bowing to the four sides of the stadium. Next, the fighters kneeled and bowed then started to bounce around on one knee while stretching the other back behind them. They bounced and stretched, stood up and bounced and stretched some more. I’m sure this had some spiritual significance beyond limbering up. Sorta like sumo and the rice throwing or something. I do not know what that significance was. Next, the fighters removed the headbands (but kept the armbands) and got warmed up by a trainer while standing in a wide, circular baking pan. Really, that’s what it looked like. After that, the fight began. There’d be a couple of fans calling out bets, but there’d be few takers. Round would end. The fighter would extend his arms and his trainer would rub him from his chest to the bottom of his stomach with one hand and pull on the elastic band of the fighter’s shorts with the other. I do not know why the trainer had to expose the fighter’s man parts to the ceiling. Maybe the trainer was just to letting ‘em breathe and reduce the effect of swass and swalls. The baking pans would come back out, this time with a wooden stool placed in the middle. The fighter would get instructions, get stretched and rubbed and watered. Then they’d go to the next round. With each round, the crowd would get more into it. The gamblers would start to get a feel for the fight and begin to set their own odds. The gambling would get more and more frantic, plateauing at Round 4. By then the crowd was yelling with every hit and screaming numbers frenetically. Men waved different finger combinations like shadow puppet masters who wanted their charges to come alive. They’d scream and yell simultaneously trying to find matching gamblers and urging their fighter on. We’ve already established that, in small doses, I like crowds. It’s partially because I like how they make me feel small. It’s also, though, because they make me feel like I’m a part of something larger than myself. When a crowd cheers as one, you can feel the power of the collective. They’re trying to will an outcome. Through their voices, hands, and feet they’re channeling focused energy to their favorite. The fighters would grapple, exchange blows. Give a knee, take a knee, give a knee, take a knee. In unison, every time the crowd’s favored fighter gave a knee, they’d all say, “Aaaaaaay!” (as in “hay” without the “h”). Since half the crowd bet one fighter and the other half the other, the “Aaaays” would resound for every hit. The “Aaaaaaaaays” would get louder and louder. Give a knee (“AAaay”), take a knee (“AAAAaaaay”), give a knee (“AAAAAAAAaaaaaaaay”), take a knee (“AAAAAAAAAAAAAAAAAaaaaaaaaaay”). These men had increased the intensity of watching two men pummel each other not only by gambling on the outcome, but by adding the testosterone of a trading pit. It was like feeding an already hyperactive two-year old fistfuls of Snickers bars that’d been dipped in maple syrup and dusted with Pixie sticks and cocaine. There were nine fights that night. I saw the middle five. The next to last one (#4 on the program) was the most competitive and the most heavily wagered. I could tell the crowd thinned afterward, but I stuck around for one more, just to see if anything else happened. With the gambling dying down, the fanatics became less invested. The cheap seats started heading for the exits. Soon there were as many people ringside as in the stands. That’s when I decided to go. I joined the men leaving the arena and drifted out to take the MRT. That’s when I realized that the one “man” thing I hadn’t seen all night, other than from the farang, was drinking. Really. If they were pounding booze, they were doing it out of sight. I hadn’t even seen anyone noticeably drunk. Guess the sport’s not so manly after all. Stupid Travel Tip of the Day: If you want to pay the cheapest price for your tickets, make sure you look Thai, and can speak and read the language. No, seriously. Thais pay about a fifth or less than what foreigners do for the same sections by using a special ticket window. If you show up looking farang, they’ll send you to an English window and charge you 1000 baht for a 220 baht cheap seat, 1500 for second class, and 2000 for ringside. Not So Stupid Tip: If you want to pay the cheapest price for your tickets, make sure you look Thai. No, seriously. It worked for me. 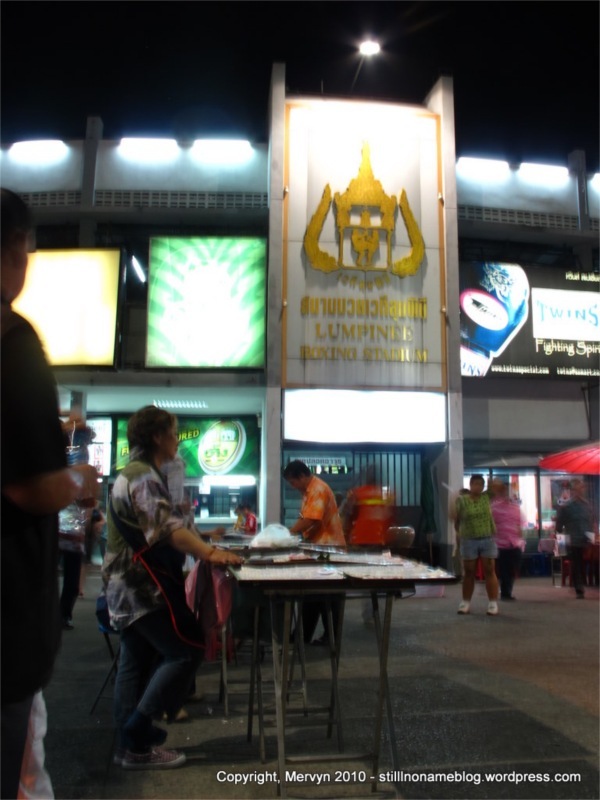 When I got to Lumpinee, I sat on a pillar near the ticket window and pretended to check my phone for text messages, sorta like I was waiting for someone. I was really just watching how ticket purchasing worked. When I thought I’d figured it out, I girded my loins, checked my phone one last time for effect, then walked up to the ticket window with a Thai sign above it. I shoved a 1000 baht note into the window, held up one finger, and put my hands into my pockets. The person behind the counter handed me a ticket and counted out 780 baht in change. I took my time at the window arranging the stack of bills so they went neatly into my pocket, just like I’d seen others do. Then I walked towards the entrance where the guy in front of me was headed. An old man almost blew my cover when he gave me a program (written all in Thai) and tried to say something to me. I tried saying, “No, thank you,” in Thai. “Mai, krap.” He got more insistent, then pointed at the fourth fight listed on the program. I laughed, then walked quickly on. Later, I figured out that he was probably trying to tell me that the fourth fight was the best. I walked up to the entrance, handed my ticket (written all in Thai) to the ticket collector, which he took without a word. Then I walked in. Eight hundred baht saved. I’d have preferred to sit in the second best seats, but I couldn’t figure out how to buy those and, if I’d paid at the farang window, it would have cost me 1500 baht. The extra $45 just wasn’t worth it to me. I stuck with my $7 seats.